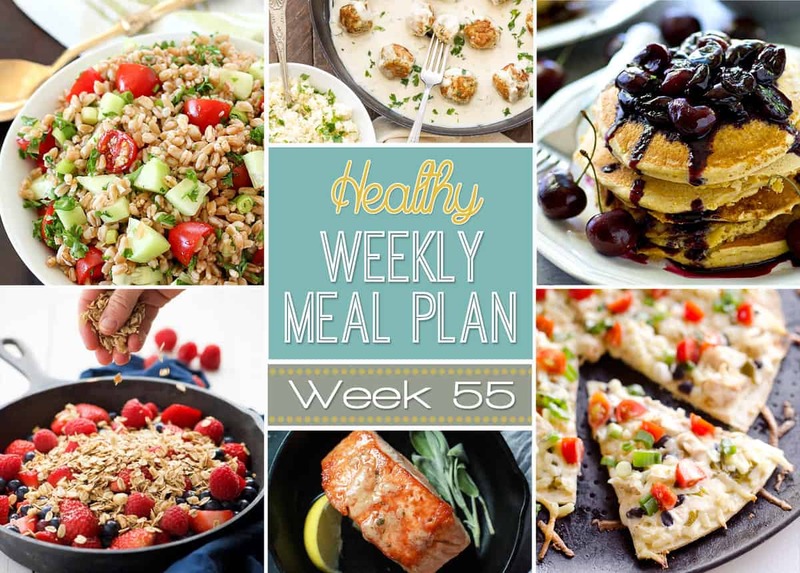 A delicious mix of healthy entrees, snacks and sides make up this Healthy Weekly Meal Plan #55 for an easy week of nutritious meals your family will love! This week we have got lots of lightened up comfort food on the menu. From browned butter and sage salmon and lightened up Swedish Meatballs to Southwest Chicken Pizza and Berry Crisp, your taste buds will be thanking us this week. There is no reason healthy food has to mean just salads and rabbit food, and we certainly are serving up a delicious variety of satisfying dishes this week! 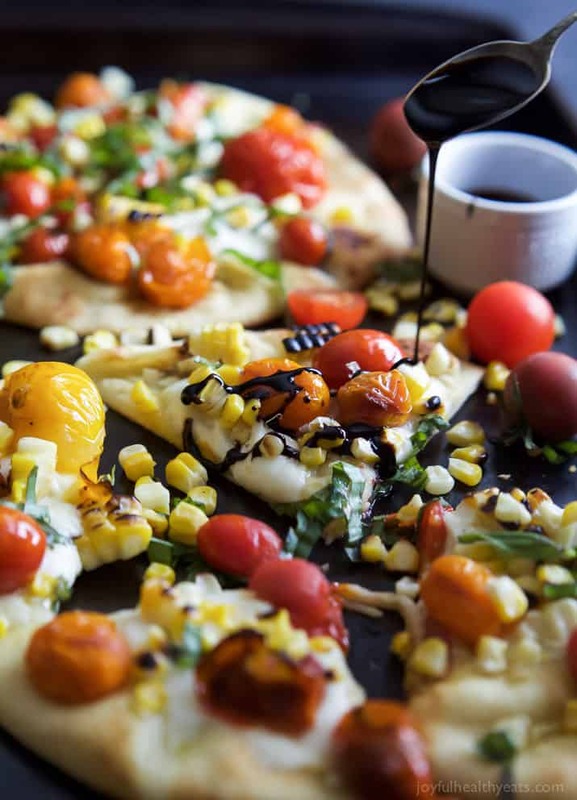 An easy delicious Charred Corn Caprese Flatbread topped with sweet Balsamic Reduction – it screams summer, takes 30 minutes to make, and uses less than 10 ingredients! You’re gonna love it! 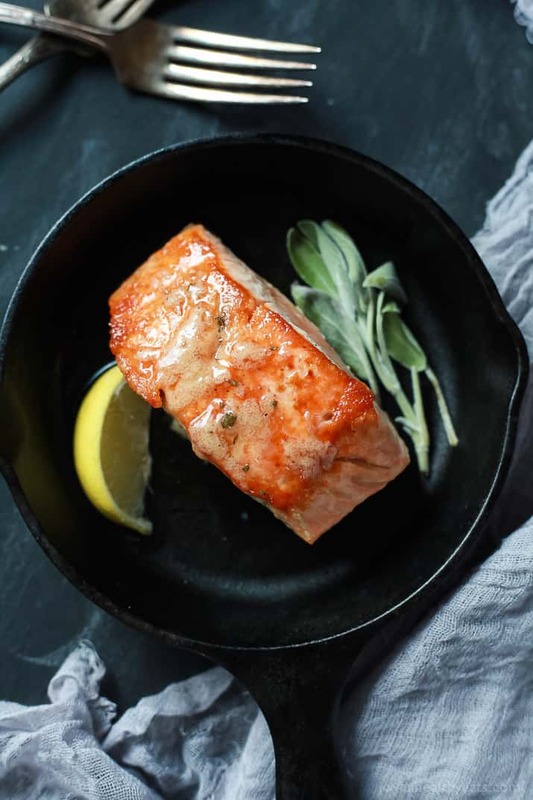 Perfectly Pan Seared Salmon topped with a nutty Brown Butter Sauce with subtle hints of fresh sage and nutmeg for one to die for bite. This Salmon recipe screams fall, takes less than 30 minutes to make, and is 300 calories a serving! 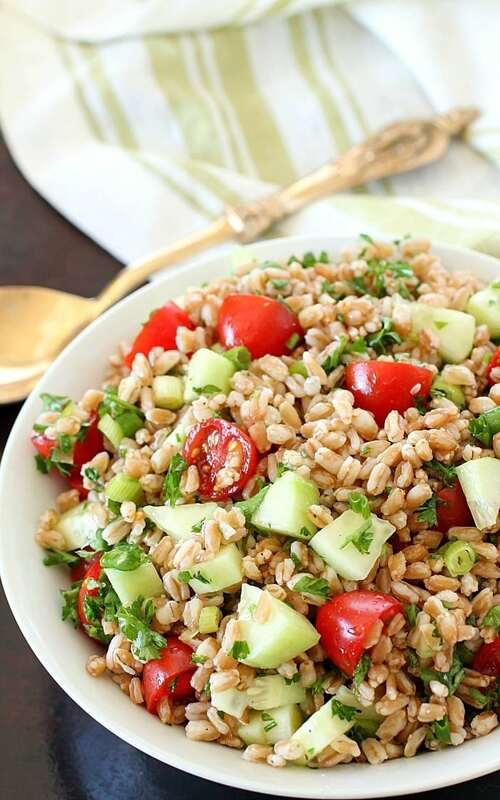 Easy Greek Farro Salad is full of tender farro, tomatoes, cucumber, green onions, parsley, and tossed in an olive oil & lemon dressing. Super easy and delicious side dish! 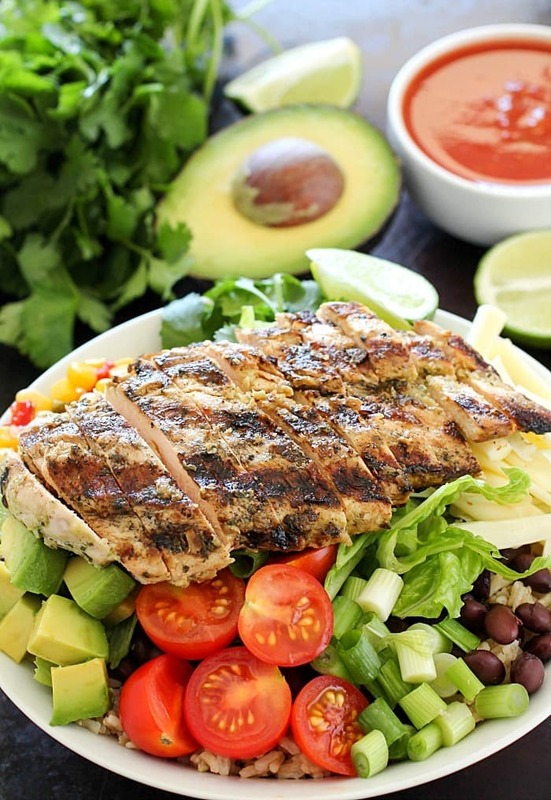 Chicken Burrito Bowl is loaded with tender, marinated and grilled chicken, brown rice, black beans, lettuce, corn, avocado, cheese, green onions, cilantro, tomatoes, salsa and a ranch taco sauce. So fresh, delicious and healthy! 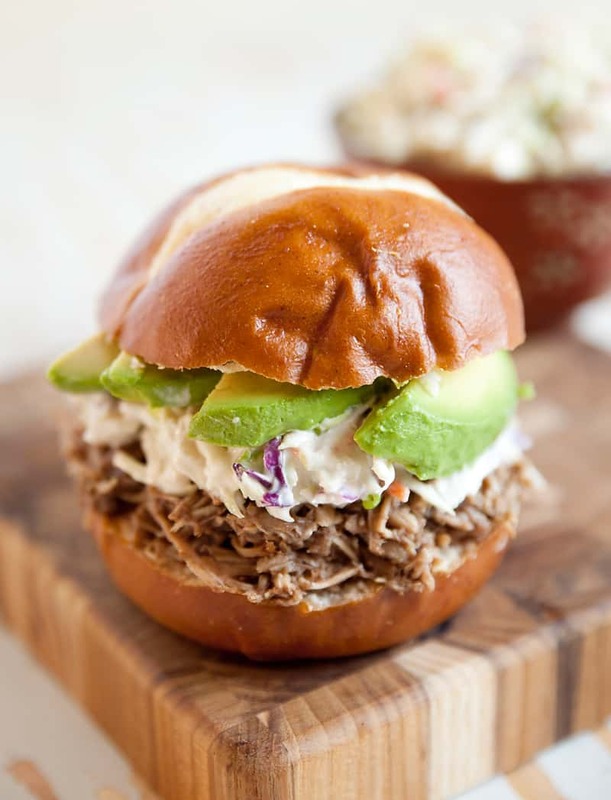 Pulled Pork & Bleu Cheese Slaw Sandwich is delicious and simple sandwich recipe with pulled pork made in your Crock Pot for an easy weeknight dinner idea! Perfect for a post-weekend detox, this Mixed Berry Power Salad will jump start your healthy goals for the week and you will love every power-packed bite! Spicy Basil Hummus is so delicious and with only 7 ingredients, it couldn’t be easier to make! Fresh basil, chickpeas and a touch of red pepper take this classic hummus up a few notches! Gluten Free Vanilla Triple Berry Crisp is a simple 8 ingredient dessert that is bursting with fresh berries that bake into a juicy sauce; then topped with a sugary oatmeal topping. A gluten free and vegan dessert that is healthy enough for a breakfast treat! Southern-style citrus cornmeal pancakes are a match made in summer heaven with a sweet fresh cherry compote piled on top! These fluffy pancakes are the ultimate summer weekend breakfast. Light & Spicy Southwest Chicken Pizza is an easy 20 minute recipe bursting with bold and spicy flavors. 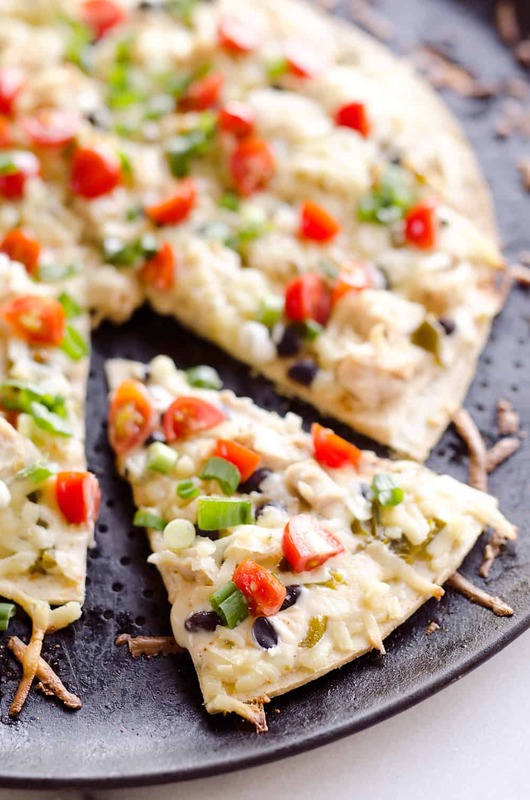 A thin and crispy crust is topped with shredded chicken, black beans, jalapeños and pepper jack cheese finished off with fresh tomatoes and green onions for a delicious lunch or dinner idea. These Healthy Swedish Meatballs with Cauliflower Rice Pilaf are an undated version of a recipe I grew up on. 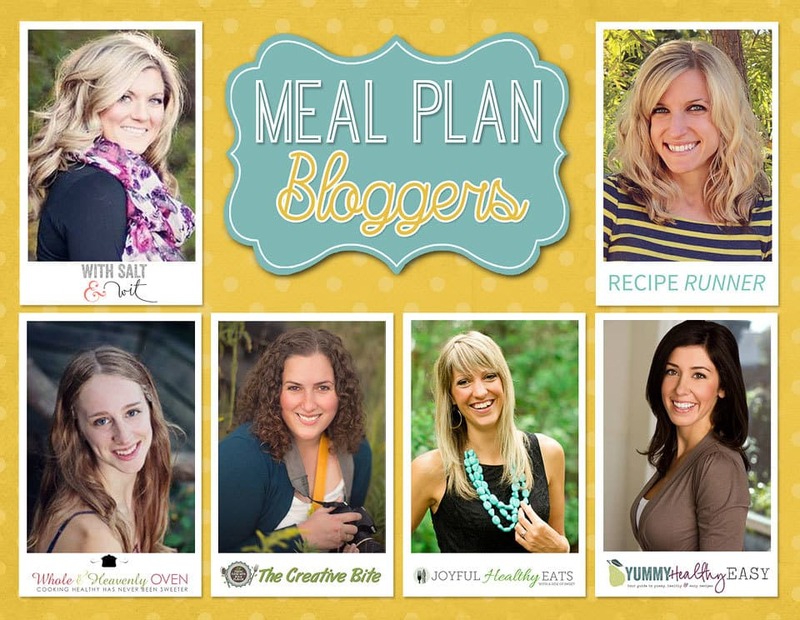 You won’t find any canned condensed soups with weird ingredients in here! Made with real ingredients that you can feel good about serving your family and putting in your body!